The Front Rest (FR)-which also goes by the name of the Fulghum Rest-was designed by Ken Fulghum, a world class rim fire bench rest shooter. The Rest has been used by winners in competitions across the nation including IR 50-50, ARA Outdoor, and RBA Indoor. Some of the Front Rests have been bought by casual shooters who just want the best. The FR was designed with precision in mind. All parts, other than bushings, are machined from aluminum or solid steel bar stock. The windage/elevation assembly rides on two hardened and ground steel rods with a tolerance of .0005 of an inch. 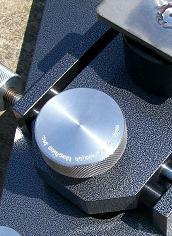 The risers of the elevation unit are also ground and honed to within the same tolerance. 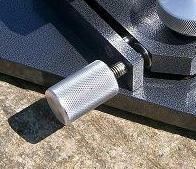 The windage is controlled by turning a knurled knob on either side of the windage/elevation assembly. The knobs turn a screw against positive spring pressure to eliminate “chatter.” Elevation of the rest is controlled by an offset knob. This knob utilizes a timing gear and belt drive to eliminate all but the smallest amount of “backlash.” Make note that the top is allowed to swivel on the elevation base to allow for excellent repeatability when returning to target. The rest is available in a standard color for $750* (Price is for rest only, tops not included. ), or many custom colors, for a small extra fee. Click HERE for sample colors and different views with the optional tops. Still not convinced? Check out the review and comparison of our Front Rest in Precision Shooting Magazine, April 2010, Vol. 57, No. 12, pages 86 thru 90. Old style, single windage rest is still available through custom ordering.